What to say about the last 4 days… where do I begin? The beginning would be the obvious choice, but I think I need to go beyond this weekend. I think I need to go back nearly 10 months ago. Back to when we said goodbye to Chicago – again – and hello to our home state of VA. Granted we aren’t very close to where we grew up, but we cut our distance in half. Coming “home” will be easy I think. I know how to be like these people and will slot right into a new full life. A life that I thought would be full of friends, small group, church community, and friends for my son. Then here we are with none of that. AS I said before – I AM AN EXTROVERT. I love being around people. Other than some random meetings with neighbors out for walks and familiar faces at the gym, it just has not happened. This past weekend was the worldwide meetup for a no-travel, where you are retreat hosted by (in)Courage. Through social media we develop relationships with others, but we need to see skin. We need face time with others (in)RL – in REAL LIFE! I hemmed and hawed about going because it didn’t seem like anyone was doing one near me. This all changed when I was tagged in a Facebook post by a friend I had gone to church with several years ago. She’s friends with a local gal here who was hosting a meetup. I was IN! It was just completely awesome that this gal’s name is Lisa-Jo. 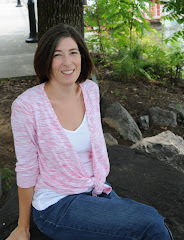 If you read many blogs, you may know her better as The Gypsy Mama. Lots of tweeting later with her and another fabulous co-host that couldn’t come and I was starting to feel like I was connecting with people here for the first time. The day arrived and I finally met Lisa-Jo. She was the only one there I “knew”. I think I was the only person who actually came alone. I picked a table because of a plaque sitting on it and a celadon colored bag that was speaking my name. This put me right beside her and with two other lovely ladies that live relatively close to me. I was right where I was supposed to be! Pinterest success!! 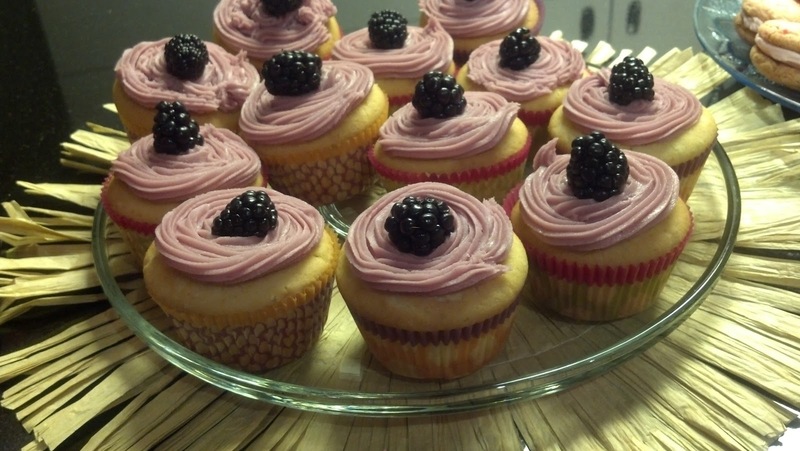 Key Lime cupcake with blackberry frosting! You’ll see many posts out there that will summarize the content of the amazing videos and giveaways. They will cover that. What I left with was three new friends; friends that I know intimate details about after only a few hours. Isn’t that the difference between an acquaintance and a friend? We were real with each other. We shared joy, fear, frustration, tears, prayers and cupcakes. We also took that great photo in yesterday’s post. 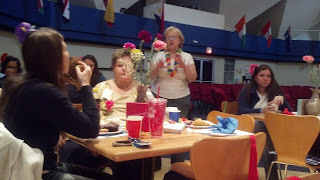 We were just 4 at our table and about 40 at this church out of 1700 women all connecting around the world. Amazing stuff! I ended the night pulling a Beth Moore, Ann Voskamp-style! What?? I was face down on the floor thanking God for the thousand and more gifts I’ve received from him. Many on that very day. Friendship is breath to me. I had come up for air. This breathing isn’t instinctive, it’s work. I have to be intentional and seek it out and maintain it for it to continue. It has renewed my longing to do so. So I ask you, how is your real life community? Who wears the skin that you press against in hugs and high fives and hands on shoulders? Do you have that at all? If not, seek it out. It can be painful at times, but it is so worth it. Our rough edges are smoothed out as we bump up against each other in daily life. What does community and friendship look like and mean to you? This post is linked up with (In)Courage. This is so great! We are very blessed to have met Lisa-Jo, shes wonderful. I'm glad you had a nice time at the event. I believe they are planning another meetup soon!!!! I think we need our own meetup since we never really had the chance to talk. No little boys included. :) Hate that you weren't able to be with us. I have a happy heart reading this Amy! Sometimes it takes longer than at other times. I have a feeling that you will be able to look back on this "dry" spell and KNOW exactly what God's purpose was. For one, it put you in a place where you were longing for friendship. And perhaps He wanted you to learn what it is like for the introverts? I love you friend and can't wait for some real life time with you!!!! Thanks, Becky!! It's all about the learning. This was a new one for me. Even the discovery of new online friendships has been new and nothing I'd ever dreamed I would be interested in, but there they are. That said, I'm so looking forward to smelling the coffee in your cup when we are together. Thank you so much for your openness and for just showing up in the first place. I don't think it was any accident that we live as close to each other as we do and sat at the same table! Can't wait to see you again! I am NOT an extrovert, so I did enjoy watching from my bedroom, but I know I should go outside my comfort zone occasionally! 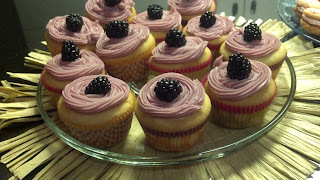 :) and I really want those cupcakes... or at least the recipe!! (I keep replying in the wrong place)The cupcakes are right on my Pinterest boards. They are from a beautiful blog called Baked to Perfection. Lisa-Jo is a real sweetheart. Lastly, you are welcome in VA anytime. You really do need to go next year, I recommend going near you, you might just meet a neighbor. - I did x 2.